The Octavia Books Book Club will gather on Saturday, January 17, 2015, 10:30 A.M., to discuss Conrad's classic HEART OF DARKNESS. Newcomers are welcome, and when you purchase the book through us, you receive a 10% discount. This book club meets the third Saturday of each month, unless otherwise noted. Northshire Classic Mystery Reading Group will meet Friday February 14th at 2pm in bookstore conference room. This group will meet every other month for a discussion of two classic mystery titles. Description:Everyone is welcome! Participants must obtain a copy of the book to read before the meeting. No registration is needed. Joseph Conrad , The Secret Agent. Joseph Conrad is currently considered a "single author." If one or more works are by a distinct, homonymous authors, go ahead and split the author. 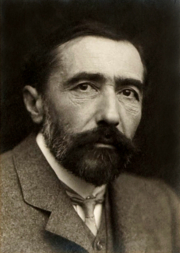 Joseph Conrad is composed of 43 names. You can examine and separate out names.